Rob is just going from strength to strength in the right direction, though his musical course has altered from someone whom a once described as a “Cumbrian Nick Drake”. 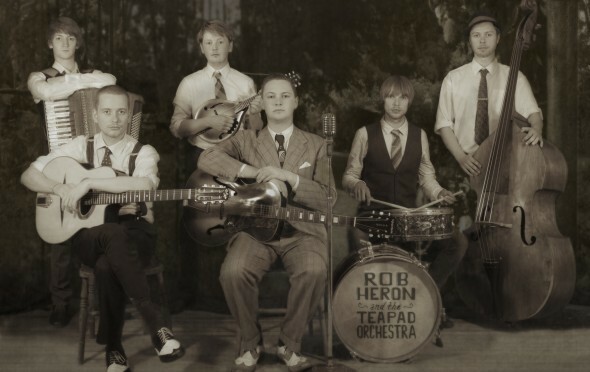 Not that I’m complaining as the Western Swing, Gypsy Jazz, Hokum Blues, Ragtime, Cajun, and Roots-of-Country music Rob makes with The Teapad Orchestra is damn fine and can get you a struttin and a dancing with the best. You’ll probably get the chance too, as these guys are so hard working that they’ll be at a venue near you soon. The best have also had Rob open for them too, Pokey LaFarge and The South City Three invited them onto their last UK tour and praised as “The best of the bunch” . The video above is from their “Songs From The Shed” appearance which in itself is more evidence of their steady progress up the ladder. Rob and the guys are making it, well deserved too. This entry was posted in Best New Musicians & Great Music Videos, Events & Festivals and tagged Festivals, YouTube Clips & Uploads by Alan Whittaker. Bookmark the permalink.